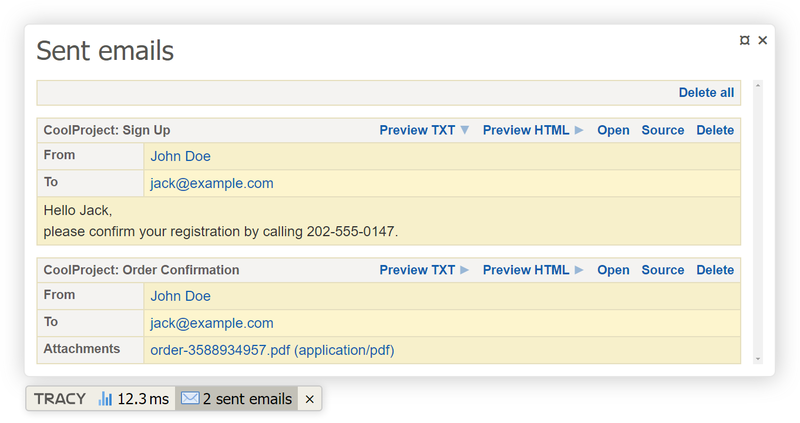 MailPanel is extension for Nette Framework which captures sent e-mails in development mode and shows them in debugger bar. Nextras Mail Panel is an extension for Nette Framework which captures sent e-mails in development mode and shows them in Tracy bar. and to change default mailer to Nextras\MailPanel\FileMailer. Messages has to be sent by injected instance of Nette\Mail\IMailer. Based on MailPanel by Jan Drábek. New BSD License. See full license.